When it comes to travel companions, babies are by far the biggest freeloaders. They don’t walk, you have to carry their stuff, and you can’t split the driving with them. As a new parent determined to keep traveling, I quickly learned that even if you’re a seasoned light packer, your baggage footprint doubles on vacation with a baby. Just managing that intake-output cycle of bottles and diapers takes up a lot of room. So when I found out about Steri-bottles (after three vacations with a hungry baby), I was pretty keen to try them out on the road. What Is it: Steri-bottles—single-use, recyclable baby bottles. Price and Where to Buy: About a dollar a bottle (sold in five- and 10-packs) from Amazon and Babies R Us. Pros: They’re efficiently packaged, which is a huge plus when packing. They’re recyclable, which made me feel a lot better about resorting to single-use bottles. 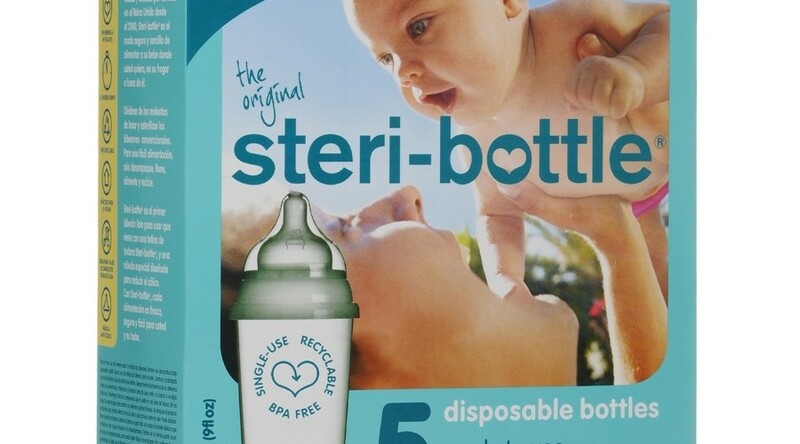 Steri-bottles are also BPA- and phthalate-free. Caps keep prefilled bottles from leaking in transit. Cons: Since the bottles come stacked together for maximum space efficiency, you’ll have to have an additional storage option (like a gallon ziplock bag) if you want to just toss a few into a diaper bag in a sanitary way. And bottle tops are a non-standard size, so they’re not pump compatible. Usefulness: 10/10. Not needing to find a clean staging area for bottle washing every few hours made vacation feel a lot more like vacation. The baby in my user tests reported (via satisfied grunts) that the bottles performed well. Portability: 8/10. If you want to travel with less than an entire box, you’ll need to have your own bag on hand to keep them clean. Value: 7/10. They’re around a buck a bottle, so it’s not the cheapest option. But frankly, not needing to travel with a bottle brush is priceless. Durability: 6/10. They’re about as durable as a water bottle. Which means they’ll weather being tossed once or twice by a baby, but won’t fare as well if you accidentally drive over one in a rental car. Cool Factor: 2/10. They’re baby bottles, not sunglasses. Though it’s pretty cool that they’re recyclable and BPA- and phthalate-free. Final Verdict: A very useful option for bottle-fed babies on the go.